You can now manage Android apps for your users when using basic mobile management. Previously, you could only do this if you used advanced mobile management. Admins: Go to Admin console > Device management > App Management > Manage apps for Android devices, to start to whitelist and manage Android apps. End users: No action needed. Users in basic mobile management domains will now see a “Work apps” section in the managed Google Play store. The section contains the default G Suite apps and other apps that are whitelisted from the Admin console. To help your users find the apps they need, you can organize apps into collections. These collections appear on devices in the “Work apps” section in the managed Google Play store. With basic mobile management you can now automatically install apps on your users’ devices. Use our Help Center to find out how to manage app preferences. Note that preventing users from uninstalling apps, and some other advanced features, require advanced mobile management. You can now create and manage web apps in the Admin console. Web apps look like native apps and can make web pages easier to find and simpler to use on mobile devices. You can also distribute web apps the same way you distribute native apps–by adding them to collections in a managed Google Play store or automatically installing them on users’ devices. You can now create private Android apps directly from the Admin console. Simply upload the APK and give the app a title. The app will appear in the managed Google Play store within minutes. You can also install the app directly on your users’ devices (see above). Previously, it took several hours to create and publish an app, and you had to create a Play Console account, provide a credit card, and fill in many other fields before the app would be available to your users. 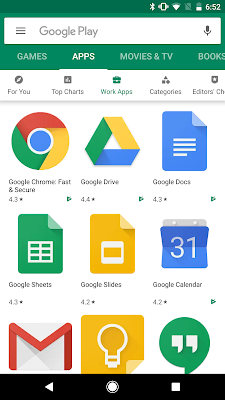 The ‘Work Apps’ tab in the managed Google Play store has the G Suite apps and other apps whitelisted by admins. This feature will be OFF by default until app management is set up, and can be enabled at the domain, OU, or group level.